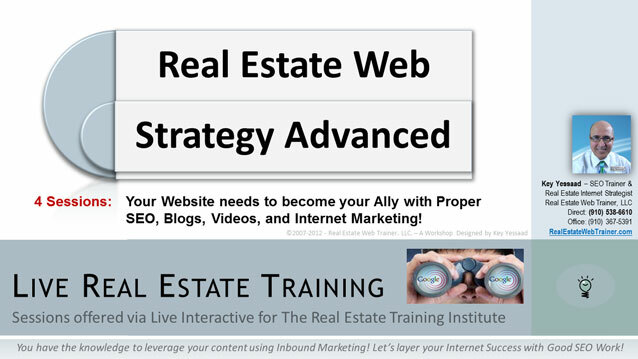 Real Estate Web Strategies Advanced was designed for Real Estate Agents and Brokers who understand the proper tools of their Web Containers (Websites), and now have embarked on a journey to rank for their primary keywords. SEO, or Search Engine Optimization, is driven by two (2) fundamental ideas: Your Website (Content) and the links that come to you (Backlinks). Of course there are other criteria that play a big role such as Anchor texts, Landing Pages, Blog Tags, Social Media Channels, and Stickiness  but the core must always be about taking care of the Sellers and Buyers in your Local Area. Consumers have voted that if they pick the Right Real Estate Professional they feel taken care of; but many of our Real Estate Agents fail to convey that care using their Website. Educating your Local Community about the local trends, the Real Estate Deals, and How-Tos of Financing, using your website with Short Clip Videos and SEO is becoming job 1. Real Estate SEO Trainings  Key Yessaad, Internet Strategist (910) 538-6610.